Southport Reporter� covering the news on Merseyside. THE response to The Liverpool Shakespeare Festival from the people of Liverpool has been more than we could have hoped for. Five weeks before the premiere, several performances are now fully booked and the others are filling up rapidly. We are proud to announce the confirmed cast for Macbeth. After an exhaustive audition process, we have assembled exactly the right team of actors for the job. Every member of our creative and production team lives in and around Liverpool. Rehearsals for Macbeth begin on 23 July 2007. Lodestar members are invited to attend an open rehearsal on Wednesday 8 August 2007 in St James' Gardens. There is still time for you to get involved in the production. If you would like to learn firsthand more about how a show like this works or if you would simply like to be part of a creative team, please get in touch by email. Letters To Editor:- "Help our volunteer museum please!" "WE are a volunteer run museum that receives no funding and survives on a small admission charge , donations and the generosity of veterans and staff, we have just gone through a phase of expansion into additional space that will allow us to take on bigger displays and carry out restoration projects that will be viewable by the public, we now need to attract further visitors to the museum and hope by some kind of article in your newspaper this may help us, we rely on visitor income to allow the museum devlop and expand, if you follow the museum link below you can learn more about us, a brief summay follows. The RAF Millom Museum operates in partnership with the Lancashire Aircraft Investigation Team, South Lancashire Aviation Research and Peak District Air Crash Research were the collections of these groups are displayed, at the museum we cover the aviation and military history of the North West which includes Lancashire, Cumbria, Merseyside, Greater Manchester, North Cheshire, North Wales and the Peak District. We have assisted in the publication of numerous books and articles and the making of a number of television programmes including in 2004 the filming of an episode of Channel 4's "Time Team" archaeological program where two American A-26 Invaders aircraft were recovered from a marsh near Preston. Talks/presentations are also undertaken to various organisations. We aim to research and record the aviation heritage of our region and where appropriate to recover and preserve associated artifacts. Whilst our primary interest is in the air war over the North West of England during WW2, our research extends back to the earliest days of aviation, during which the region played a prominent role. During WW2 the region was largely associated with training of aircrews and aircraft building and maintenance, although it is true that Manchester and Liverpool suffered badly during the Blitz. Thus most of the incidents we research involve accidents during training or testing of aircraft. Though the human cost was none the less tragic for the families of those who lost their lives or the memory of their sacrifice any the less important. Wherever possible we try to ensure that the results of our research and any finds we uncover go on public display and regularly organise temporary displays at local libraries, museums and occasionally schools. An important part of our group's activities is the publishing of the findings of our research on the group's websites. These sites are regularly updated with new information on ongoing research projects and detailed accounts of new projects as they develop. In this way we are able to share the results of our work and have built up an extensive network of contacts with aviation historians and writers world-wide, who in turn share information with us. Therefore we are appealing for those with memories of the war/home front etc to contact the Museum or a regional with personal recollections and photographs or memorabilia etc to add to a permanent display on life here in the North West. Any person doing so will receive free admission to the museum. We would also gladly receive any donation or loan of material to enhance and further grow the displays for the benefit of future donations. However small a donation or loan may be it will gladly be appreciated and collection can also usually be arranged. I hope you may be able to assist us in some way to keep the museum moving forward and providing a valuable resource for the region." Mark Gaskell, www.rafmillom.co.uk. WE were invited, between 13 July 07 to 15 July, 2007, along with www.scifimachines.com to the first ever Celebration event held outside the U S, run by Lucasfilm Ltd. and The Cards Inc. Group. This shared many of the highlights of Celebration IV in Los Angeles plus some added extras. 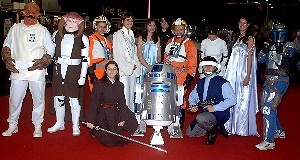 The occasion was to mark the 30th Anniversary of Star Wars. Many do not realise that many of the sound sets were built and shot in the UK, for most of the films and that huge amounts of computer graphic design work on the latest films were UK constructed. "I'm thrilled that we're finally going to have an official Star Wars event in the U.K., and especially to celebrate 30 years of the saga. 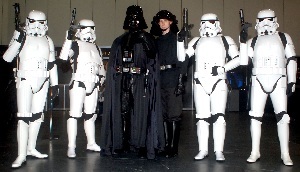 George Lucas has referred to the London area as the 'spiritual home' of Star Wars since four of the movies were shot here, making this the ideal site for our first Celebration Europe event." said Steve Sansweet, Lucasfilm's head of fan relations. "Star Wars has always been a global phenomenon, and the UK has long been our second-largest fan base after the US." Sansweet added, "With the continuing strength of Star Wars, it made sense to extend Celebration to Europe and I'm delighted have been working with one of our top European licensees, Cards Inc., as our partner on the show." The event was to hold many surprises for us and one of them was the connection with cast members and Liverpool! More in a few weeks on that one... Star Wars Celebration events have been held regularly in the U.S. since 1999 and are the ultimate festival of all things Star Wars, for enthusiasts of all ages and this one was no exception to the rule. 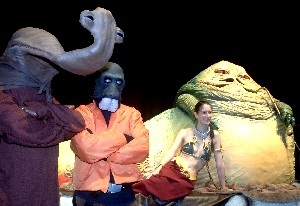 The event was filled with live entertainment, celebrities from all six movies, special film and video presentations, an exhibit of movie props and costumes, exclusive merchandise, pop culture tributes, interactive events, a costume contest and much else. It also included a large screening of episode four, outside. Not surprisingly, we found many fans from Southport and Formby as well as from Liverpool at the event, many of whom were involved on the countless stands. 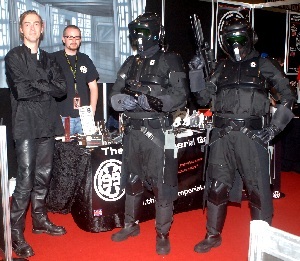 John Thompson from scifimachines.com said:- "It was a fantastic show, with huge amounts of energy. I was really shocked when I got a call from Lucasfilms to head on over and exhibit part of my collection of arcade machines at the event. 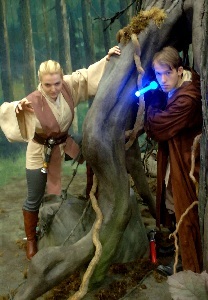 I have always been a fan of Star Wars and this was a dream come true. It is fantastic as well that the UK has been recognised for its role in the ground breaking films."